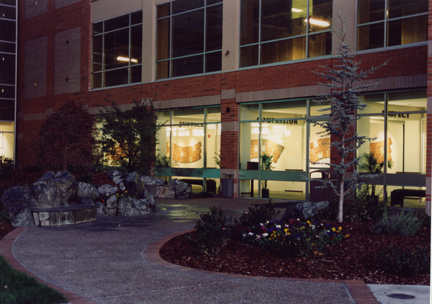 In September 1999, Providence Medical Center in Medford, Oregon, opened its $10 million Cancer Center. During the planning stages, hospital employees and cancer survivors searched for an innovative way to add meaning and hope to this state of the art facility. They called upon the artisans atIllahe Tileworksto create a mural honoring all those who have fought the battle with cancer. On National Cancer Survivors Day, in June 1998, the Providence Medical Center invited cancer survivors to attend a celebration of hope and life. Over 1,000 individuals, families and friends attended an afternoon of food and music. With the assistance of Sue Springer, artist and owner of Illahe Tileworks, and numerous volunteers, each person made a print of their hand in terra cotta clay. 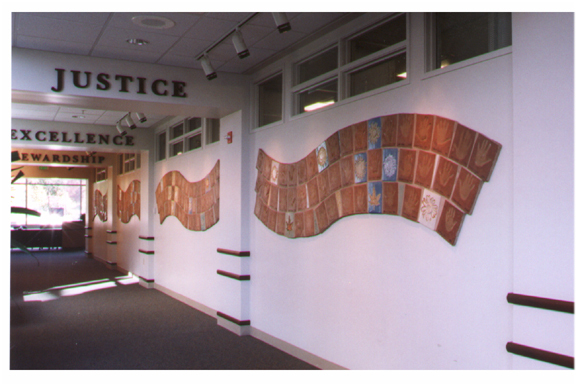 These hand print tiles were combined with brightly glazed tiles depicting the four seasons and the core values of the Providence Medical Center to create a 100 foot mural that graces the halls of the Center’s entryway.